Marie’s 23 Questions are designed to raise the profile of experts in the skincare and cosmetic industry. The skincare field and beauty industry is often known to be superficial; at SkinScience, we want to shine a light on leaders who are authentic and those who bring depth while raising awareness of what they do and who they really are. Dr. Michael Kassardjian specializes in medical, surgical and cosmetic dermatology and is a supporter of humanitarian causes. He has personally traveled extensively to various parts of the world on medical missions to provide aid to individuals who do not have access to healthcare. 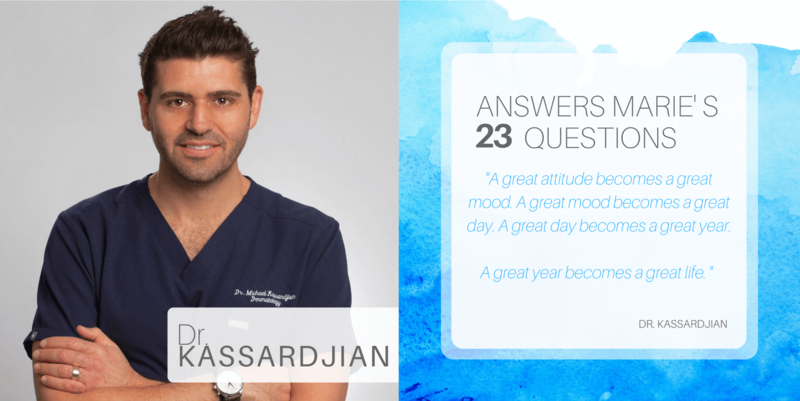 Dr. Kassardjian is passionate in the advocacy for early detection of skin cancer and treatment and is dedicated to the importance of maintaining and improving healthy skin, and utilizes various techniques ranging from injectables, peels and cosmetics to meet his patient’s needs. He is always striving for each patient to have a great experience. 1.What leadership lessons have you learned? To include everyone and to work together – you’ll always accomplish more that way. To do a medical mission to Armenia. 3. Where do you hope to be 15 years from now? I hope to be doing what I’m doing today. Helping people in all aspects of their skin. Hopefully I’ll have done more outreach and medical missions by then. 4. When have you felt the most proud? The first time I saw my son. 6. Which words or phrases do you most overuse? Those are marks of wisdom (when referring to age spots). 7. What advice would you give your 20-year-old self? 8. What is your idea of perfect happiness? Being with my family unplugged from all technology. 9. Which historical figure would you most like to meet? Nelson Mandela, Franklin D. Roosevelt and Mohammed Ali. 10. What is one of your biggest pet peeves? The price of prescription medications. 11. Where would you most like to live? I would like to split time between Los Angeles, Barcelona, Montreal and Cannes. 12. What do you most value in your friends? The people I can always laugh with, no matter what’s going on. 13. What is your motto? A great attitude becomes a great mood. A great mood becomes a great day. A great day becomes a great year. A great year becomes a great life. 14. Describe yourself in one word. 15. What excites you about your career? The variety – I can be removing a skin cancer, a minute later doing Botox, and then seeing a baby. I enjoy having the opportunity to work with great people and to get to know my patients personally. 16. Who is your favorite hero of fiction? 17. What is your greatest fear? Not living my life to its fullest. 18. How do you relax after a stressful day? Playing basketball, boxing or working out or listening to old vinyls. 19. Do you speak any foreign languages? 20. How does your background shape your outlook? I grew up in a big close knit family and played sports all my life. That has helped me work with others and work together. I grew up in a family of very caring people (always volunteering in local hospitals, etc). This helps me care for others and be involved in volunteer work. 21. What is your favorite part about being a dermatologist? Skin is the largest organ of your body and when you look carefully at it, you can diagnose internal disease, and assess nutrition and lifestyle. It’s a window to the inside. Also the variety as mentioned – medicine, surgery and cosmetics – technology is always evolving. 22. In your opinion, what is the biggest challenge facing our industry? People who are not trained in the field properly and doing procedures they are not qualified to do. 23. What do you look for in the people you hire? Team players – the office works together and everyone is important and needs to come together for an office to be successful.